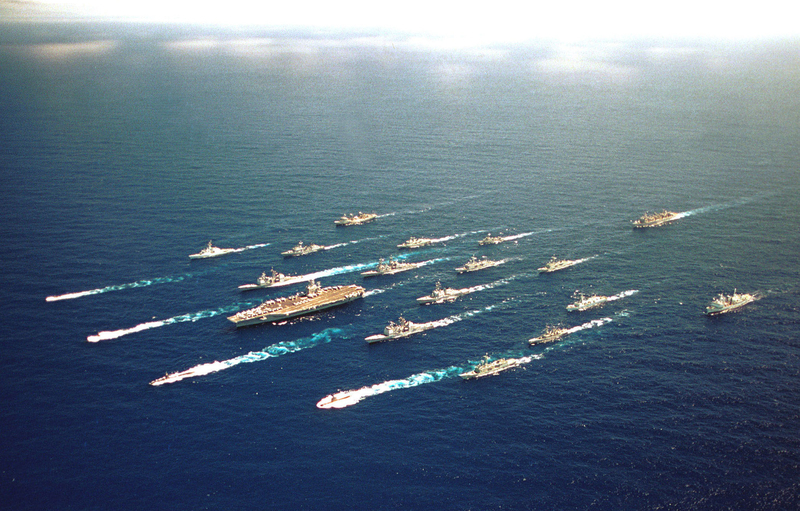 Off the coast of Hawaii – the ABRAHAM LINCOLN Battle Group along with ships from Australia, Chile, Japan, Canada, and Korea steam alongside one another on 18 June 2000 for a Battle Group Photo during RIMPAC 2000. Thinking about What’s Next again today whilst nursing a hangover and it occurred to me that it has been a very long time since I have done anything Naval. The naval thoughts were further developed when I ran across a blog entry, Chinese Navy Sails Forth, with a fleet built from a Navwar fleet pack for the PLAN and using the Shipwreck rules ((note that the publisher’s website does not seem to be loading at the moment)). I have often looked at aerial photographs of a US carrier battle groups (like the USS Abraham Lincoln battle group to the right) and thought, hmmm. Modern warships are kind of neat, especially in their uniformity within navies. In World War 2 and earlier there were big differences between vessels in the same navy. In modern times the colour if the vessels is consistent across a navy. Apart from modern naval, which is something I have never played and is therefore interesting from that point of view alone, I also have the 1/1000th Battle of Lissa Italian and Austrian fleets here to paint as well. So now the decision is between the Victorian Science Fiction (aeronefs) and modern naval. As I have a business trip coming up this week, I will have plenty of evening time to ponder the next period. I already have a good core for a navy…just not sure what scale?